Today, Jupiter, Fla., is as familiar as a spring training home to the Cardinals and their fans as the bird on bat is as a logo. In 1998, though, when the Cardinals left St. Petersburg for Jupiter, it was very much like landing on another planet. The Cardinals had trained in St. Petersburg, on Florida’s serene west coast, from 1938 through 1997 (with the exception of three years when travel was restricted during World War II). Jupiter is on Florida’s east coast, in glitzy and congested Palm Beach County. The move 200 miles southeast was prompted by several factors, including the chance to train in larger and more modern facilities and because the American League expansion team, the Tampa Bay Devil Rays, arrived in 1998 and made St. Petersburg their base. Sharing the Jupiter complex with the Cardinals in 1998 were the Montreal Expos. Today, the Miami Marlins are the Cardinals’ spring-training neighbors. This was the last year of rickety old Waterfront Park in St. Pete. The memories of many of that spring … included a favorite watering trough – the crowded Sundown Club of lightly publicized St. Petersburg Beach. The beach would have superstars Joe DiMaggio and Stan Musial having a drink, back to back. As Red Schoendienst recalls, if a young ballplayer or young reporter would have had $2,500 to spend then, he could have acquired enough sand dune-seaweed waterfront real estate to make a small fortune. Schoendienst’s first spring in St. Petersburg was in the 1940s. Cardinals broadcaster Mike Shannon, who enjoyed St. Petersburg, quickly became a Jupiter booster because of the quality of the baseball facilities. For a number of Cardinals fans, the spring migration to the soft breezes and lazy life of St. Petersburg, Fla., was a given – like barbecuing in the summer and tree-shopping in December. In Palm Beach County, life, as well as traffic, moves more briskly. Adding to the excitement of the Cardinals’ first spring at Jupiter was the arrival of slugging first baseman Mark McGwire. He had been acquired by St. Louis in July 1997. He arrived early for his initial spring training at Jupiter. “I love it,” McGwire said to Rick Hummel of the Post-Dispatch. 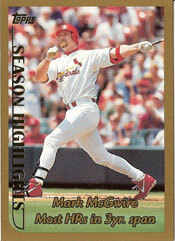 McGwire went on to hit a record 70 home runs that season. The Cardinals have won two World Series titles (2006 and 2011) since they started training at Jupiter. Playing at 6,800-seat Roger Dean Stadium, they had their best spring training game attendance averages in the years after those championships: 6,600 per game in 2007 and 6,700 per game in 2012, according to the Palm Beach Post. As always, a nice trip down memory lane. I do have a bit different slant, though. While of course the Jupiter facilities are far superior, who is to say a new modern facility could not have been built in the St. Pete area? Going to Jupiter was like relocating to the suburbs where land was cheap and plentiful, but with nothing going on. Leaving the old neighborhood behind seemed too easy of a decision. Now, the Cards are in a pickle geographically because many of the teams on the east coast have moved away. They have to play the same few teams over and over or take three-plus hour bus rides. That problem would not exist had they stayed on the Gulf Coast. Of course, that isn’t going to change. Thanks for reading and for your comment. Check out the Web site http://www.tcpalm.com for an exclusive story on how 2 more teams (Astros? Blue Jays?) could join Cardinals and Marlins in Palm Beach County for spring training. Is this the story you are talking about? Very non-specific.